Each of cycling’s 5 Monuments has its own set of unique characteristics, but the Ronde Van Vlaanderen (Tour of Flanders) more than any other contains the ultimate in uniqueness of a one-day classic. Paris-Roubaix has long, difficult cobbled sections, Liege-Bastogne-Liege has a series of never ending Ardennes climbs, but the Ronde has both. Known as “Bergs” these short, very steep cobbled climbs define the uniqueness of the Ronde. The race route has changed periodically over the years. For the first 30 years it was a loop through Flanders starting and ending in (or around) the City of Gent. When World War 2 restricted the access to many of the roads of Flanders a major course change was presented. 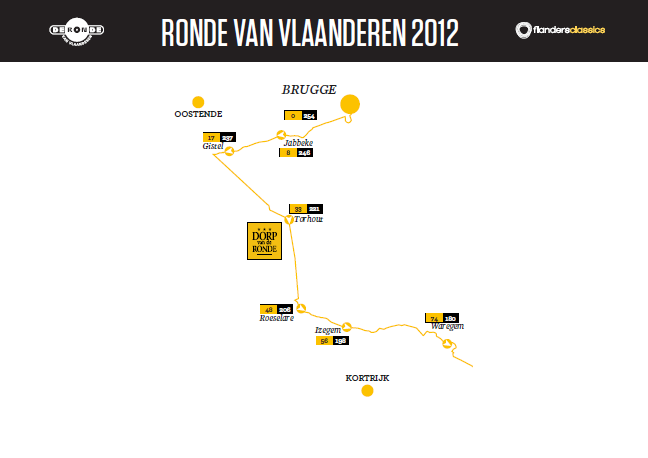 During these years the race route became a limited circle around the heart of Flanders. Following the war the Ronde began to establish its uniqueness with more cobbled bergs added to the race course. 1919: the first hills in de Ronde: Tiechemberg and Kwaremont, until 1929. 1928: first time over the Kruisberg, 3 hills. 1930: also over the Kerselareberg/Edelare, 4 hills. 1950: now 5 hills, the famous "Muur" Geraardsbergen (Muur Gramont in French) until 1952. 1953: the Muur replaced by the steep Kloosterstraat (cobblestones) until 1960. 1966: also the Kloosterstraat in Geraardsbergen is back in the course. 1970: The return of the Muur Geraardsbergen and the 1st time over the Bosberg (the "final" climb). 1974: The long awaited return of the Oude-Kwaremont. 1976: The 1st time over the Koppenberg, 9 hills. 1981: Climbs increase to 11 hills. xxxxxx rider, Jesper Skibby, wheels on the Koppenberg. After a renovation the Koppenberg returned in 2002. 1990: The number of hills is up to 13. 2004: 18 hills now used in the Flemish Ardennes. Changes are again coming for 2012! With the contract of the “finish” City of Meerbeke/Ninove ending possible changes to the closing sections of the race route were investigated. The Tour of Flanders wishes to be a leading and contemporary race; now and in the future. Baring that in mind, we decided in 2010 to investigate the possible arrival towns. We took a year’s time to properly explore three possibilities: Ninove/Meerbeke as the traditional arrival area since 1973, Oudenaarde, home to cyclists and a town full of heritage and Ronse a town with a history in cycling. The choice fell on Oudenaarde. Although we are aware of the strong qualities of the other cities, our feeling is that Oudenaarde can provide the best assets for the Tour of Flanders in the future. After a smooth section of 20 kilometers the riders take on a clenched final section of 75 kilometers built around three loops on the Oude-Kwaremont and Patersberg in combination with the Koppenberg and Kruisberg. This provides a new concept concentrated around four crucial hill slopes in the Flemish Ardennes within a stone’s throw of each other. The ultimate final, being ten ascensions and two cobbled roads followed by a straight line to the finish in Oudenaarde, will provide a challenging setting for the race. The new final section is very accessible. It allows cycling fans to witness the apotheosis of the race in the best circumstances. Without having to move around, fans can experience the multiple passages on the Oude Kwaremont and the Patersberg and really feel and even smell the final stage from the first row. The celebrations alongside the track will become even more intense. One hundred thousand cycling fans make the Tour of Flanders what it is today. The competition and heroic efforts of the cyclists in the hill slope scenery are always accompanied by the sound of festivity with good food and drink. 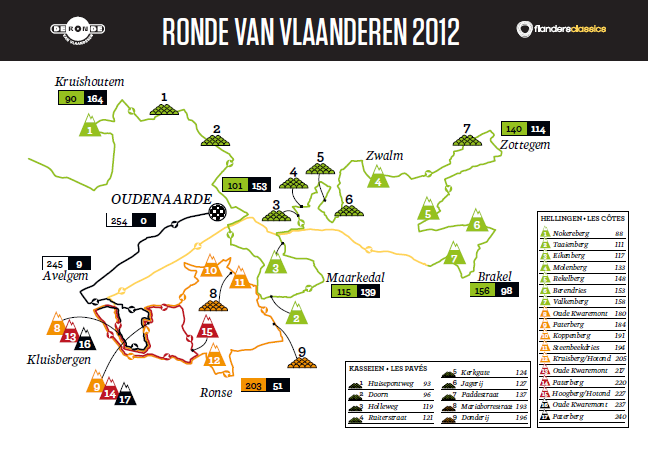 Vlaanderen’s Mooiste has become a massive event. That is the power but also the weak point of the race. Safety is our first priority. Our efforts in consulting and collaborating with government officials become greater every year. The special intervention plan becomes more complex every year. The new track allows less movement by the spectators and hence provides possibilities for optimizing service and safety measures in the finish area. We want to provide an improved execution of the safety plan, the traffic plan, waste disposal and services for the fans (parking space, shuttles services, etc…). In short, the new final section will allow us to manage the event better and will therefore honor the experience and the fair battle even more. Ever since the first edition in 1913 the Tour of Flanders has undergone many changes in departure and arrival areas. The Tour of Flanders is a living monument to cycling but also wants to invest in a great future. Its ability to adjust is what makes the Tour of Flanders a monumental race. In spite of all these changes the classic remains a classic. The final section contains the traditional ingredients of the Tour of Flanders: cunning hills and cobbled roads in the heart of the Flemish Ardennes. Oudenaarde with its historic center, its wonderful Town hall and its unique experimental museum ‘Centre Tour of Flanders’ lies in the center of this new track. Oudenaarde breaths passion for cycling for a lot of recreational riders and cycling lovers. 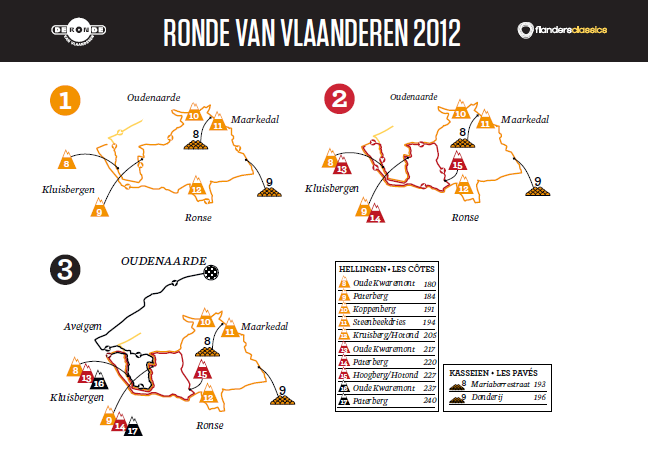 These drastic changes resulted in the finish line moving from Meerbeke/Ninove to Oudenarde (home of the Centrum Ronde van Vlaanderen, the Tour of Flanders Reality Museum). Sadly the victims of this change are the dramatic climb of the steep Tenbosse, the famous climb of the Muur van Geraardsbergen and the longtime final climb of the Bosberg. Opinions are mixed, Fabian Cancellara, winner in 2010, said he liked the new finish of the Ronde. He never liked the long flat road from Tenbosse to the Muur and the closing flat kilometers into Ninove after the Bosberg. While Cancellara liked the new course, some riders felt the new race course may be too hard. 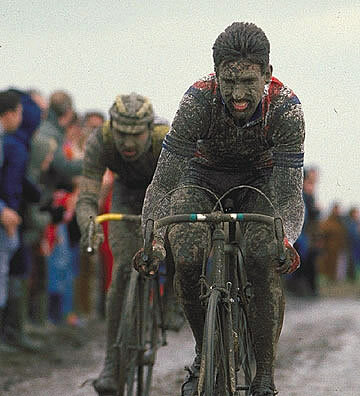 Three-time Flanders champion Johan Museeuw said: "Three times up the Oude Kwaremont and Paterberg can blow you away. The course didn't really need to be made harder, I think." Many cycling fans Worldwide (especially the traditionalists) also expressed feelings against the changes. Most thinking the changes were being made for commercial reasons. The removal of the Muur van Geraardsbergen has not been well received by the Ronde faithful. EDITORIAL NOTE: Here at CyclingRevealed we are praying for really disgusting weather! Wind, rain, and cold, the excitement of an old time Flandrian spring storm that will properly challenge a rider’s ability to stay upright and maintain traction on the cobbled climbs. The toughest, strongest rider (a true Flahute) will win!!! The more recent editions of Flanders (and Paris-Roubaix) have been run under sunny skies and relatively mild temperatures. Both races are due for an epic race story. The new course and bad weather could provide that opportunity in 2012.